They use sensational titles as THE ULTIMATE INFAMY, covering-up that even if true, their Superiors with their behind the scene creation of fake pension claims hide such REAL crimes as Katyn Massacres, crimes against the Palestinians, etc. How Hitler committed THE ULTIMATE INFAMY at Auschwitz by making an Olympic Swimming Pool for the residents of Christian and Jews. How many such Swimming Pools has Bible bogus state, Israel, made for the thousands of Palestinians they have in jail? By using patsies such as BBC and Laurence Rees, the Pension Fraud Crimes (PFC) fraudsters can deflect attention away from their own criminal acts. Thus million of pension money has disappeared and in spite of Interpol, and others, none has been collected. The money has all gone to the wind, and none of our corrupt politicians demand that a thorough investigation be made. 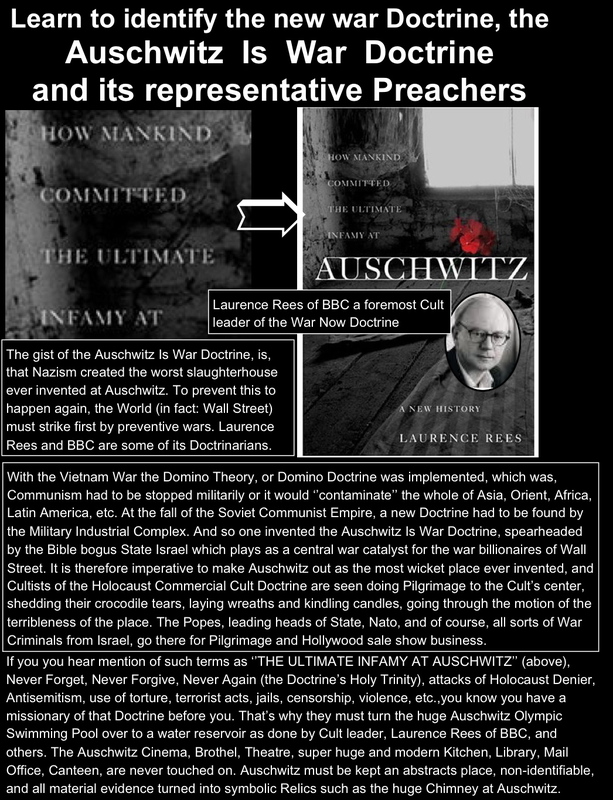 As soon as the perpetrators get attacked they shout for that BBC, Laurence Rees, the whole of HD of Thought Terrorists (TT), and others, help them out. Here is the REAL infamy. The fact that a small clique of Pension Fraud Crimes (PFC) swindlers can operate without impunity by a continuous Pension Fraud Crimes activities. Some of them were caught, such as Bernard Madoff, Ed Fagan, and others. Some died rather quickly, such as Robet Maxwell and Werner Nachmann. But the Pension Fraud Crimes (PFC) just continue on. Laurence Rees is one of the chief of patsies who has successfully brainwashed youth to believe that the huge Auschwitz Swimming Pool is just a water place where babies can splash around in. If you think it is a Swimming Pool, it is your imagination that is at work. By clicking TT or Thought Terrorists you will get further information about the Pension Fraud Crimes, its patsies, and Skirt Hanger Ons (Zechariah 8:23) of misfits, scatterbrains, Senile and Alzheimer victims who can’t help their kleptomania acts and preferences, and men of violence.